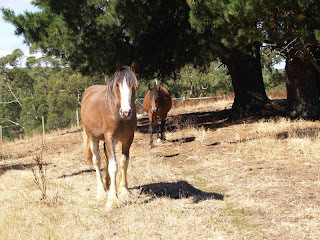 The horses - Cass (the clydesdale) and Jess (my old standardbred mare). 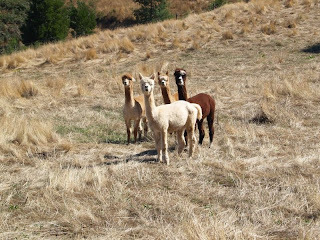 And the alpacas (who only just returned to the farm after an extended visit to my parent's place for their shearing). Rusty (dark brown) and Tobey (white) have lived here before, but the 2 fawn coloured boys are newbies. They seem to have settled in well. I am spinning up their fleeces, they will be jumpers etc for us. Its still so dry here... We had a few days of really lovely rain - about 30mm or so, and not in one heavy fall but gentle and over a few days. But we haven't had any rain since, and although its not hot, its been pretty warm, so not much green around here.... Although its done wonders for the vegie garden, and zuchinnis are being formed again (it seems that if the plant is water stressed it drops off the fruit before its big enough to pick.... so now I know why I have never grown many zuchinnis!). We have also discovered that a pair of Wedge-tail Eagles are nesting on our farm! Its very exciting, but also means that once we get more animals we will have to make sure ducks and chickens will be safe. Not that we mind, they are stunning birds, and its great that they are here.